Today was the first day I wore the new pants, and mostly they’re fine, but wow are they long. At 5 foot 7, I am not used to things being long on me. Apparently the people at Columbia think when ladies get fat they also get tall or something. The length works okay with my ski boots because ski boots are wide at the top and the pant legs sort of bunch up over them. With the hiking boots I wear to and from the hill, the back of the pants are about an eighth of an inch off the ground in back. When I take my hiking boots off when I get home, I’m walking on the pant legs. 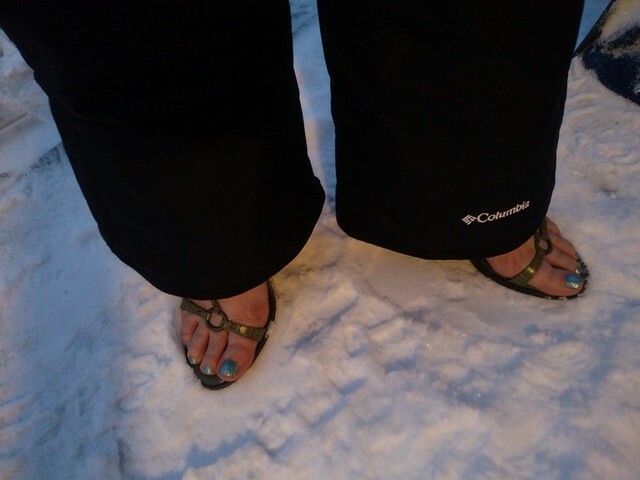 The length would seem to work best with high heels, so I tried that look out tonight after I shoveled the decks. So chic! So impractical! But the pant legs are neither dragging nor bunched up, so I’ve got that going for me.